The Office of Public Relations invites you to tap into the ideas, insights and information available at Centenary University. We are ready to assist members of the news media with inquiries regarding Centenary University, our academic programs, events and plans for the future. We can also offer you access to faculty experts who can provide ideas, insights and information on a range of topics, including the arts, business, education, environment, politics, society and more. 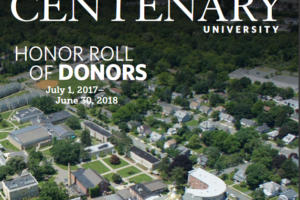 Centenary’s continued success is made possible through the generous support of the individuals and organizations listed in this report. We also thank our anonymous donors. We salute alumni, friends and benefactors for helping to send forth graduates who lead by serving others.